The son of parents who’d fled the droughts of the Oklahoma dust bowl, Merle Haggard was born in a converted boxcar in California on April 6th 1937. His father died when Merle was only nine so he spent his adolescence in and out of a series of juvenile institutions and his troubles with the law ended in a botched robbery attempt that won the 20-year-old Haggard, like all good country singers, a three-year stretch in the infamous San Quentin where he saw a performance by that other famous temporary resident of San Quentin, Johnny Cash, which changed his life as, on his release, Haggard too decided to pursue a career in music. Haggard, who’d begun playing guitar at the age of 12 and worshipped Bob Wills, Lefty Frizzell and Hank Williams, was soon a fixture on Bakersfield, California’s thriving country music scene and is credited with creating the “Bakersfield Sound,” with its mix of twang and steel guitars, vocal harmony and a raw edge not evident on the Nashville products of that time. 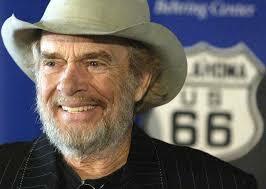 From then on he had an incredible string of classic hits including 38 number ones from his 82 singles and countless albums, the most controversial of which was his very conservative Okie From Muskogee, released in 1969 and written to support the troops after Haggard watched the Vietnam War protests. At the time he said "When I was in prison, I knew what it was like to have freedom taken away. Freedom is everything. During Vietnam, there were all kinds of protests. Here were these [servicemen] going over there and dying for a cause — we don't even know what it was really all about. And here are these young kids, that were free, bitching about it. There's something wrong with that and with [disparaging] those poor guys." The song itself reflects American small town life at the time, with its racial prejudices, anti-drug, anti-hippie message, and there is still a lot of controversy over both its lyrics and its intent – was it a satire or a straight song – which has led to it being much referenced in film soundtracks ever since, like Convoy and Platoon. Never really out of the country music spotlight since then, Haggard continued to record and tour prolifically both on his own and in collaboration. In fact what has turned out to be his final album was a collaboration with the outlaw country music legend that is Willie Nelson last year, when they recorded “Django and Jimmie” in honour of their own country heroes Django Reinhardt and Jimmie Rodgers, which also features a track in tribute to the late great Johnny Cash, written by Haggard, and a song that is the absolute antithesis of his earlier strait-laced Okie from Musgokee and features the joyous line "I gotta hundred dollar bill, You can keep your pills, friend, It's all going to pot." As recently as a couple of weeks ago, Haggard was still hoping to continue his hectic touring schedule, issuing the following apology for having to cancel his April concerts, as well as dates in February and March, as he was taken back into hospital again with double pneumonia, following on from his bout of lung cancer in 2008, from which he never recovered. "I want to thank my fans for their prayers and well wishes. I hope to be back on the road in May, but I'm taking it one day at a time." Sadly that was not to be the case but his prolific back catalogue and huge legacy to the world of country music ensure that his insightful music will continue to be heard in places a lot further afield than Musgokee.